CNN anchor Erin Burnett on Tuesday slammed Hillary Clinton for her continued silence on the explosive sexual harassment complaints against Democratic donor and movie mogul Harvey Weinstein, saying she gave him a "pass" that she did not give to women who did not vote for her. Weinstein has been fired from The Weinstein Company and seen his career go into a tailspin after a New York Times report detailing numerous settlements he'd made with women accusing him of sexual misconduct. Since the story broke, more tawdry stories about the powerful Hollywood producer have come to light, such as a television reporter saying Weinstein cornered her and masturbated in front of her at a restaurant in 2007. 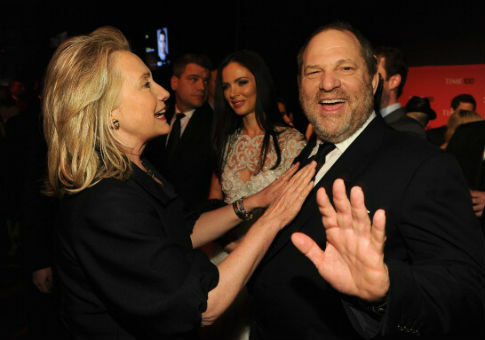 As Weinstein was a major supporter of Clinton and the former Democratic presidential candidate positioned herself as a champion of women's rights, she has been criticized for not speaking out about the allegations. In 90 minutes of remarks at UC-Davis on Monday night, Clinton never addressed Weinstein once, and Burnett took notice. "HRC spoke for 90 mins last nite, didn't mention Harvey Weinstein. She won't give women a "pass" for not voting for her, but she gave him one," Burnett wrote. The remark was in reference to Clinton's comments that she did not give "absolution" to women who apologized to her for not voting for her last year. HRC spoke for 90 mins last nite, didn't mention Harvey Weinstein.She won't give women a "pass" for not voting for her, but she gave him one. I have asked Hillary Clinton's spox over last few days about Harvey Weinstein. "You have a lot of people since inauguration day, in the last eight months, coming up to you, women coming up to you with their daughter and saying, ‘my daughter didn't go out to vote,' and sort of wanting absolution from that," [CNN's Anderson] Cooper said. "That's happened to me," Clinton said. "What's more common are people bursting into tears, welling up. I had a lot of that at my book signing yesterday." "Do you give absolution to women who didn't vote?" Cooper asked. "No I don't," Clinton said. Clinton explained that it was very "hard" for her to offer "comfort" in the wake of her historic loss to President Donald Trump. This entry was posted in Politics and tagged 2016 Election, CNN, Donald Trump, Erin Burnett, Hillary Clinton. Bookmark the permalink.